The Junior Achievement Business Hall of Fame honors men and women who have made significant contributions to the growth of business and the economy in the Inland Northwest. The 2012 laureates to be induced in the Annual Business Hall of Fame are Mr. Don Kardong, and Mr. Mike Taylor. JA will be celebrating the lifetime accomplishments of our area's most distinguished business leaders with all proceeds going towards Junior Achievement classroom programs. Each table of 8 individuals will sponsor 2 full classrooms. For more information and reservations, available sponsorships, or Junior Achievement in general, contact Janet Banaugh, Development and Special Events manager at 509-624-7114 or email at janetb@jaspokane.org for more details. The Spokane Tribe of Indians are celebrating the grand opening of a new Arby's restaurant at Spoko Fuel in Airway Heights. Spokane Tribe's SPOKO FUEL station is located at Hwy 2 and Craig Road. The new Arby's at Spoko Fuel brings 65 new jobs to the region. Kootenai County Indicators website launch is tomorrow. EWU's Dr. Patrick Jones, who developed and operates the Spokane County Indicators website will hold an event tomorrow from 4:00 to 6:00pm at the Coeur d'Alene Resort, launching a new website, Kootenai County Indicators. The new website, Kootenai County Indicators, offers a wealth of information designed to help create a healthy, vibrant community by making data available in eight different areas: People, Economic Vitality, Education, Environment, Health, Housing, Transportation, Public Safety, and Recreation & Tourism. Demonstrations will occur after a formal presentation. Refreshments will be served. For more information and to register go to kootenaiunitedway.org or contact Caryl Johnston at United Way of Kootenai County 208-667-8112. Diamond Park 'n Jet at 5602 West Sunset Highway, is partnering with Meals on Wheels to help support our senior citizens and make sure no one goes hungry. Donate three or more perishable food items, including dog or cat food for the pets and receive a free day of airport parking or a free car wash.
Get Listed University announces that Bing (not Crosby) will be the Premier Sponsor and deliver the keynote address at their Get Listed University event Friday, April 27, from 8:00am to 5:00pm at Northern Quest Casino. Get Listed is a full-day crash course in Internet marketing (especially Local Search). Learn Search Engine Optimization tips and techniques from some of the best experts anywhere. They're also offering site clinics where you can ask direct questions about your own website (privately) to the experts themselves. Lunch, appetizers, and end of the day networking happy hour will be provided. Use the coupon code 'HOWSBIZ' to save $50 from the $199 conference price. For more information check out: getlisted.org/university/spokane.aspx. Connect Northwest's premier annual dinner event is Thursday, April 26th, 5:30 - 8:30 pm at The Davenport Hotel. The program will be 'Fueling Entrepreneurship: models for creating, supporting and funding start-up companies' with Keynote Speaker: Chris DeVore. He is the Co-Founder and General Partner of Founder's Co-op, one of the hottest accelerators of start-up companies in the country. Panelists include John Reugh, Managing Director, WRF Capital; Kevin Barber, Managing Director, Union Bay Capital; Kris Bliesner, CEO, 2nd Watch and Mitch Williams, COO, GravityJack. Registration is $75. Contact Catherine Greer at catherineg@connectnw.org or 509-358-2114 for more information. Fatbeam, a Competitive Access Provider delivering data transport services to customers in the Pacific Northwest, recently signed a long term agreement with the Yakima School District to build a high capacity fiber optic network and deliver dark and lit fiber services to school district facilities. The contract runs for eight years and exceeds $2M in total value. The school district plans to implement 20 gigabit connections between their locations on Fatbeam's network, twenty times their previous bandwidth capacity, which will enable them to implement technology services that were not available prior to the new deployment. Fatbeam's network has additional capacity that can be leveraged by local and national customers. As part of a greater strategy for Fatbeam and Yakima business development, the company will build fiber between their Yakima metro market and other strategic interconnectivity locations in the area, such as meeting the national and international long haul fiber backbone in Moxee, WA. "Having an asset such as this in Yakima, especially the availability of dark fiber, is very beneficial to potential telecom partners and enterprise customers", stated Greg Green, President for Fatbeam. Headquartered in Post Falls, Idaho, Fatbeam was co-founded by Shawn Swanby, owner of Ednetics Inc. (www.ednetics.com), and Greg Green (www.greggreen.com). For further information, visit www.fatbeam.com. OurTownZip.com, a local company providing online resources, has announced a move to new headquarters, located in the city of Liberty Lake in the TierPoint building at 23403 E. Mission Avenue. They will have offices, a conference room, and will serve as the hub of operations for the company's executive team, as well as a home base for the company's affiliate staff. Additionally, the office houses a full training center, used to train both affiliates of OurTownZip, as well as local businesses. You can get more information at OurTownZip.com. Walkers Furniture is expanding into northeastern Oregon with the acquisition of five Wilcox Furniture stores growing the company to 12 stores total. The new stores are in Hermiston, Milton-Freewater and Pendelton. Spokane Preservation Advocates (SPA) has nominated the historic Jensen-Byrd Building to the National Trust for Historic Preservation's annual list of 'America's 11 Most Endangered Historic Places.' This list has identified more than 200 historic treasures since 1988, spotlighting places across America that are threatened by demolition, neglect, insufficient funds, inappropriate development, or insensitive public policy. According to SPA's nomination, the 1909 Jensen-Byrd building is a six-story, architect-designed warehouse that attests to Spokane's prominence as a center of commerce in the early twentieth century, and contributes to the unique character of Spokane's downtown core. The National Trust has taken a special interest in the Jensen-Byrd building because in October it will convene its annual preservation conference in Spokane, an event that will attract some 2,000 preservation professionals from around the country. Greenstone Construction has begun work on the foundation and walls of the first commercial building at Kendall Yards, the 5,900-square-foot Cedar Street Park Commercial Building, at Ide Avenue and Cedar Street. When completed in September the building will have a 3,000 square foot restaurant facing the river as well as commercial spaces and a welcome center for the project. Greenstone Corp. has already built roughly 60 residential units along the west half of Kendall Yards, which are all purchased or occupied. Future commercial projects will include three or four buildings by the end of the year. Nectar Tasting Room announces that four of its wineries are joining the Spokane Winery Association. With a long history of promoting great wine, the SWA now boasts 24 members including 19 from Spokane, 2 from Walla Walla, and 1 each from Lake Chelan, Benton City, and Kirkland. "We are excited to continue the introduction of great wine to the Spokane wine community. Hard Row to Hoe, Northwest Cellars, Skylite Cellars and Terra Blanca are great additions to the Spokane Winery Association," says Nectar Tasting Room owner Josh Wade. 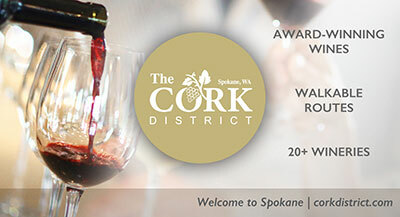 The Spokane Winery Association promotes three major events annually, Spring Barrel Tasting (Mother's Day Weekend), Holiday Wine Festival (weekend before Thanksgiving) and ValenWine Weekend (weekend before Valentine's Day). Nectar Tasting Room is on the corner of Main & Stevens in Downtown Spokane. 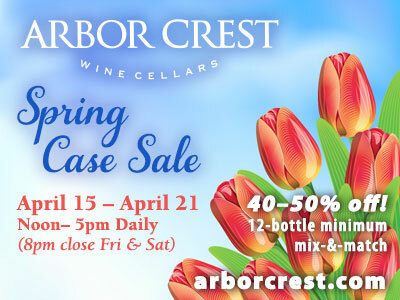 Five wineries, over forty wines, all in one location. Visit nectartastingroom.com for hours and information. The Salute to Service Expo is an outreach for members of the military community including Active Duty, Guard, Reserves, Retired, Veterans and their families, Saturday, May 19, from Noon to 6 pm at River Park Square, just before the Lilac Parade. The Expo will feature historical images, local resources, and businesses who wish to honor our military community. A portion of the exhibitor and sponsorship fees will be donated to the Armed Forces and Aerospace Museum project. When opened the museum will provide support to Regional History & Technology; Veterans and Service to Country; Aerospace Industry; and Conventions and Tourism. The Spokane Lilac Festival will be celebrating its 74th Annual Armed Forces Torchlight Parade on Saturday evening, May 19 in Downtown Spokane for the 2012 'Dream & Reach For the Stars.' The parade includes over 200 units, the Lilac queen and princesses, floats, equestrian groups and individuals, groups of veterans and active military, marching school bands and more. For more information and to request an exhibitor or sponsorship form contact Charity Doyl, Charitydoyl@yahoo.com or call 509-928-9664.